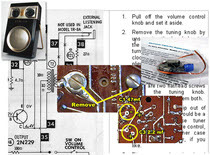 Learning how to read schematics will enable you to solve more difficult electronic issues. Besides giving you clues to how the radio is designed to operate, schematics can show you the signal flow, along with expected voltage and other test measurement points. 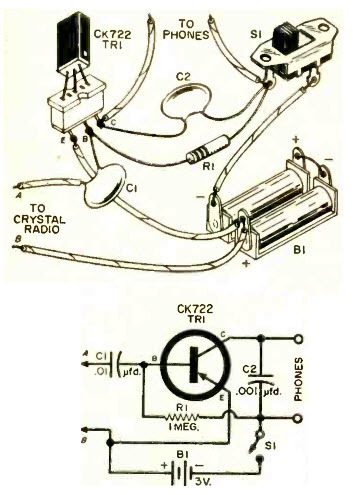 The illustration from an old Popular Electronics article shows a simple audio amplifier schematic, and what the components would look like when wired according to the schematic. the wattage ratings of resistors, and so on. 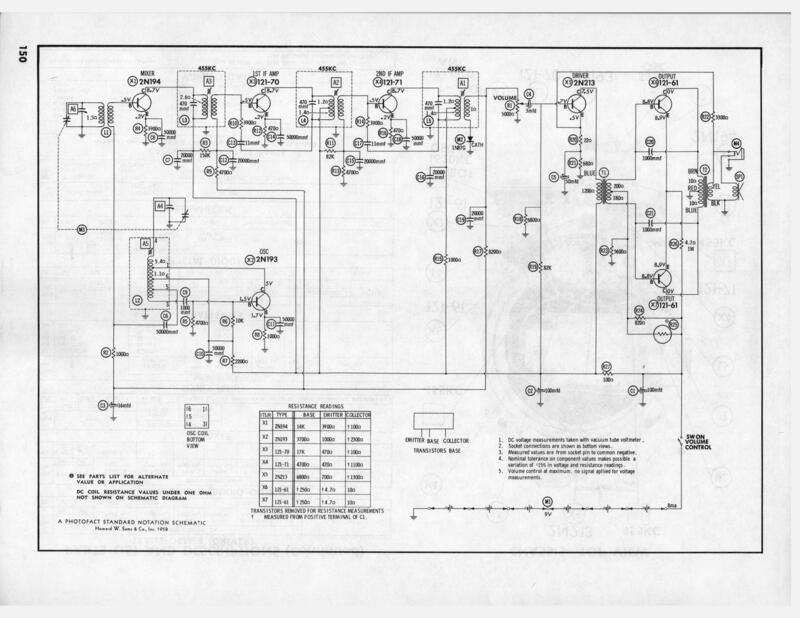 There would typically also be a parts list associated with the schematic. This would contain additional specification--component voltage requirements, minimum power rating of resistors, and so on. There might also be expected voltages and signal levels at various locations. These all help you hunt down the demons. Take a moment to study the schematic and interconnect drawings to see the correlation. Virtually every electronic device made starts out with a schematic. Some of them much more complex than our one-transistor example. Look at this Zenith radio. As you can see, each component has a unique symbol. There are, of course variations in appearance from schematic-to-schematic, but once you learn the general appearance of the common components--batteries, transistors, resistors, capacitors and so no, you will be able to identify them in any document. You will obviously need to know what each component does, and how they work together. The COMPONENTS section of this site is a great place to start that learning process. It shows you photos of components, their schematic symbols and gives an overview of what each component does. With just a little knowledge you can begin making quick, effective repairs that often get sets playing again. A few successes will give you the courage to tackle tougher issues. Once you can identify components and have even a basic understanding of what the do you can begin to trace signals through radios, spot defective components and replace them. 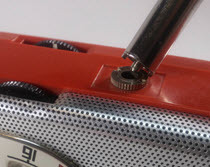 A great way to start is to replace the electrolytic capacitors in vintage sets. These are very often the reason radios no longer play. Learn More About Radio Theory. Perhaps after getting your feet wet with some quick repairs and a recap success or two you will want to learn more about radio theory. You will find an approachable theory overview here.